Behind the French Menu: Huiles d'Olive Française - French Olive oils. Enjoying France's Best Olive Oils. Huiles d'Olive Française - French Olive oils. Enjoying France's Best Olive Oils. Before the oil there were olives. Photograph by courtesy of Florena_Presse. France is not a large olive oil producer by Mediterranean standards. Nevertheless, there are eight French olive oils among the best in the world. First-time visitors to France are usually introduced to French olive oils via vinaigrette dressings but, in French cuisine, olive oil will be behind the flavor of many many other dishes. Photograph courtesy of Bilal Yassine. 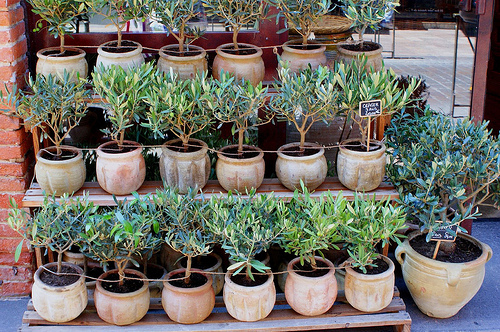 France has over one hundred varieties of olives. Separating the good from the also-ran are the French olive oils with an AOP on their labels. 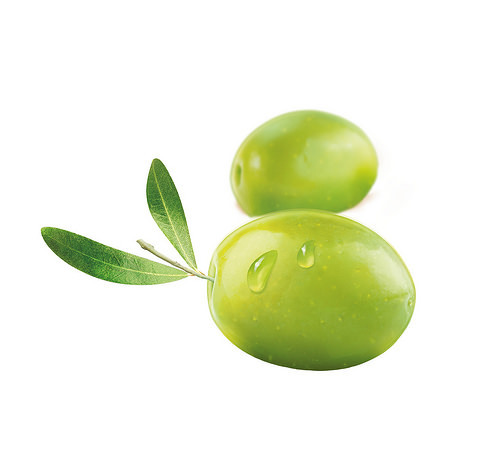 The same type of olives from different areas, growing in different soils, exposed to different amounts of sun, rain and drainage have different tastes. The oil from the best of these olives may be blended to provide the same piquancy year after year. The AOP initials guarantee the oil’s origin, the oil’s preparation, and excludes any other ingredients. 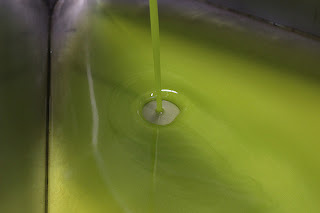 Virgin olive oils are the best oils, they are cold pressed; that is the oil from the first pressing. 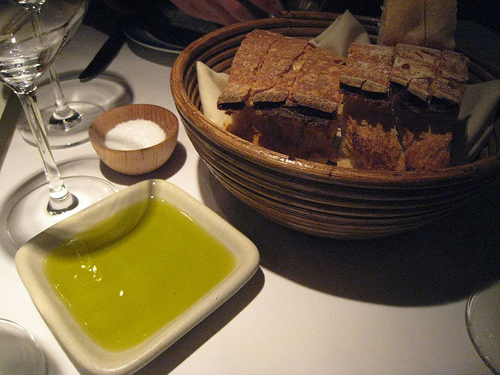 French chefs will note on their menus when a particular AOP olive oil is used. Virgin olive oils are only used when cold. The unique flavors of even the very best olive oils are lost when used for cooking. A virgin olive oil will be added cold to a dish just before serving. Courgette Jaune et Mozzarella de Bufflonne Glace à l'Huile d'Olive AOP Aix en Provence – Yellow courgettes, zucchinis, served with European water-buffalo milk mozzarella cheese and glazed with the AOP olive oil of Aix-en-Provence. Carpaccio de Veau Corse à l’Huile d’Olive de Corse AOC aux Agrumes et Copeaux de Parmesan - Carpaccio of Corsican veal prepared with Corsican AOP olive oil and citrus fruit, and served with flakes of Parmesan cheese. Le Homard Bleu Grillé aux Fines Herbes, Tagliatelles de Légumes et Spaghettis à l’Huile de Olive de Provence AOP – The European two-clawed lobster grilled with the fine herbs, the most flavorsome of French herb blends, and served with vegetable tagliatelle, and spaghetti flavored with the AOC olive oil of Provence. Saumon Mariné à l'Aneth et à l'Huile d'Olive AOP de la Vallée des Baux de Provence - Salmon marinated with the herb dill and the AOP olive oil from the Vallée des Baux de Provence. Salade de Langoustines à l'Huile d'Olive de Nice AOP - A salad of Dublin Bay prawns, the real scampi, prepared with the AOP olive oil from Nice. This is the olive of choice in many Niçoise recipes and an absolute must in a real salade niçoise. Photograph courtesy of Justin Grimes. The Pan-European AOP has mostly replaced the French AOC. For the story behind the initials, AOC and the new AOP click here. To be called a virgin olive oil all European olive oils must meet the same standards. There are only three qualities of olive oil that may be called virgin oils and they are noted below. These virgin oils are followed by two olive oils (non-virgin) that carry no fancy initials. but will still be on supermarket shelves; these are the olive oils to be used for cooking. Unfiltered Extra Virgin olive oil. Photograph courtesy of Nature And. The EU regulations include that hardest of all tests, an “organoleptic” rating. This is the taste and smell tests that are checked annually by a panel of highly trained tasters. Vierge Extra - Extra Virgin olive oil; the highest rating. No more than 0.8 % acidic content and a minimum organoleptic rating of 6.5 out of 10. 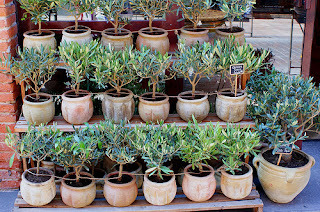 French Extra Virgin olive oil is produced in limited quantities and will never be inexpensive. Extra virgin olive oil should never be wasted by using it for cooking. (Catalan - oli d'oliva verge extra), (Dutch - extra virgen olijfolie),(German - extra vierge), (Italian - extra vergine), (Spanish -virgin extra). Vierge Fine - Fine Virgin olive oil; no more than 2% acidic content and an organoleptic rating of 5.5 or more. (Catalan - oli d’oliva verge fino),(Dutch - virgin olijfolie"), (German - vierge), (Italian - sopraffino virgine), (Spanish - virgen fino). Vierge Courante - Ordinary Virgin Olive Oil. No more than 3.3% acidic content and an organoleptic rating of 3.5 or more. This the virgin olive oil that may sometimes be used for cooking. The flavors of virgin olive oils break down at high temperatures and so they really are wasted when used for frying. Nevertheless, those who do wish to use a virgin olive oil for frying use this one. (Dutch - ordinary virgin olijfolie), (German – gewöhnliches natives), (Italian - vergine corriente), (Spanish - virgen corriente). Huile d'Olive - Pure olive oil; a mixture of refined olive oil and extra virgin olive oil with a maximum of 0.5 % acidic content. 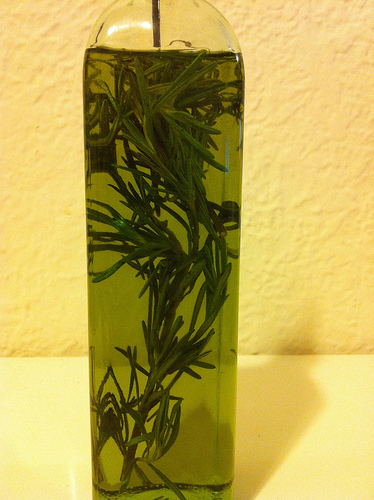 (German – olivenö), (Italian- olio di oliva), (Spanish – aceite de oliva). Raffinée - Refined olive oil; no more than 1.5 % acidic content. The refining process will have removed the unique tastes of olive oil but will have left its cooking properties and nutritional value. (German – raffiniertes), (Italian - raffinato), (Spanish – refinado). All together France produces only 1,500 tons of virgin olive oils annually, and despite the limited output the competition among these excellent oils is noticeable. 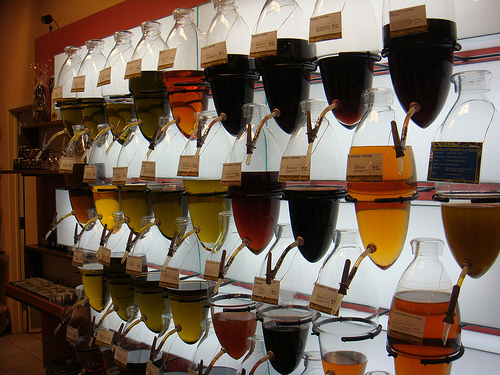 A shop selling oil and vinegar. I have had many opportunities, on my travels, to taste the best, and occasionally some of the worst, olive oils. When I have returned home I have often brought with me three or four different olive oils to try. The whole family would enjoy blind tastings of extra virgin and fine virgin oils. All you need to taste olive oils. Trying three or four different oils is simply carried out by dipping pieces of bread in saucers of the different olive oils; you may also try the oil and bread with a little Parmesan cheese. 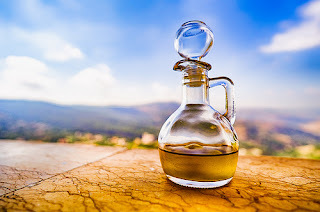 Even a newcomer to the world of olive oil tasting will immediately note the differences, and that is how we separated the oils. The best would be used for salad dressings and added cold to cooked dishes. If an oil was really not well considered then it was hidden away at the back of a cupboard; it was only to be used when we ran out of the better oils and had no alternative. In any case, olive oil should always be stored away from light so our storage did not make a poor oil worse. Huile d'Olive d'Aix-en-Provence AOC/AOP - Made with the blended oils of the Aglandau, Cayanne and Salonenque olives. Huile d'Olive de Corse AOC/AOP - In Corsican this is Oliu di Corsica AOC/AOP)- Made with the blended oils of the Sabine, Ghjermana, Capannace, Avia Nera and Zinzala olives. 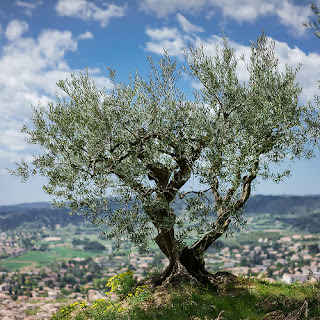 Huile d'Olive de Haute-Provence AOC/AOP – Made with the blended oils of the Aglandau, Bouteillan, Picholine and Tanche olives along with the oil of some ancient olive varieties. Huile d'Olive de la Vallée des Baux-de-Provence AOC/AOP - Made from the blended oils of the Salonenque, Aglandau, Grossane, Verdale des Bouches-du-Rhône and Béruguette olives. Huile d'Olive de Nîmes AOC/AOP - Made with the blended oils of the Picholine, Négrette and Noirette olives. Huile d'Olive de Nice AOC/AOP – Made with the oil from the Cailleter olive. Huile d'Olive de Nyons AOC/AOP - Made with the blended oils of the Salonenque, Grossane, Béruguette, Verdale and Picholine olives. Huile d'Olive de Provence AOC/AOP - Made with the blended oils of the Aglandau, Bouteillan, Cayon and Salonenque olives. Aneth – Dill. The spice with a very light aniseed flavor and a favorite in the French kitchen. Carpaccio - The Tasty, Thinly Sliced, (Ideally Paper Thin) Dish of Meat, Fish, Vegetables or Fruits in French Cuisine. Les Fine Herbes; the Most Important Herb Group in French Cuisine. Les Fine Herbes on French Menus. Salade Niçoise - Salad Nicoise. The Most Famous of all French salads; Named after the City of Nice, on the Cote d’Azur, Provence, France. Searching for words, names or phrases on French Menus?